Did I mention how much I love the first looks during Evergreen Brick Works weddings? To start with, I love first looks. They are excellent opportunities to document the genuine emotions of the bride and groom. In my travels as a Toronto wedding photographer, I have seen both brides and grooms cry during their first look. However, interestingly enough, it is usually the grooms who are more emotional during the unveiling. 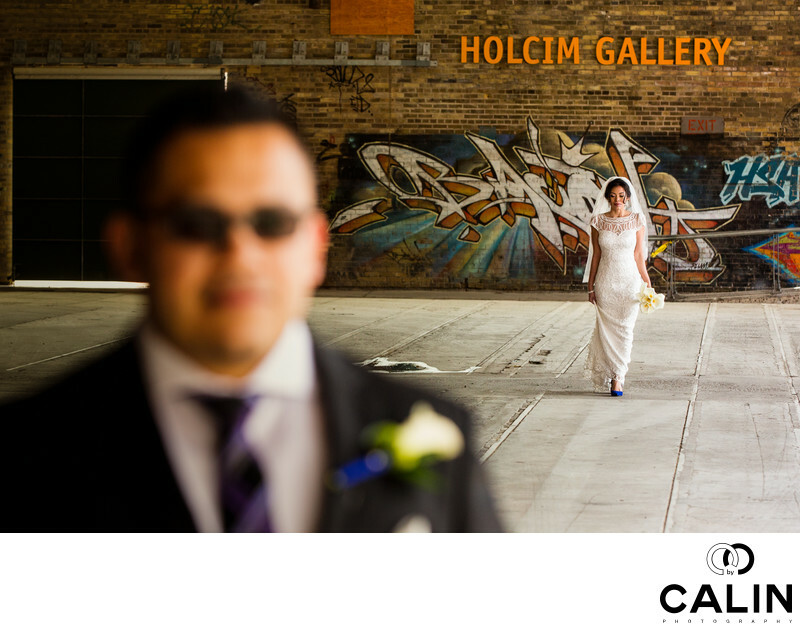 During the consultation that preceded this Evergreen Brick Works wedding, I advised the bride and groom to have a first look in the CRH Gallery, also known as the Holcim Gallery. I absolutely love this indoor outdoor venue for series of reasons. First, the light is phenomenal, which gives me a head start in creating magnificent wedding photos. Second, the graffiti walls and the bricks kilns constitute the perfect backdrop for dramatic photographs. Third and very important, because this area is covered, but still open, it can be used regardless of the season or the weather conditions. Last but not least, the CRH Gallery offers 11,000 ft.² of space. That gives me plenty of room to play with the positioning of the bride and groom during the first look. For this first look, I asked the groom to stand facing to the north side of the building, more specifically the kilns. After that, my second shooter went to announce the bride that she can come from the south entrance towards Bayview Avenue. I directed the bride to approach the groom slowly while I teased him. By having the bride walk slowly I achieved a few things: first, I have plenty of time to take good pictures of the bride and groom focusing alternatively on him and her. Second, when a bride walks slowly, it accentuates her shapes, which in essence, makes her look good. Finally, because the groom is under serious tension for long period of time, chances are he will become emotional and even shed a tear at the sight of his wife to be. In this image, the groom is positioned to the left of the frame, slightly out of focus. He's wearing sunglasses and is smiling at the camera. In contrast, the bride is walking showcasing a serious look. She has a pensive demeanour and is looking down, as if she is absorbed in the solemnity of the first look. Behind her, we see a wall covered in graffiti and the Holcim Gallery sign. As a side note, the bride and groom asked me to avoid any graffiti backdrops because in El Salvador, their country of origin, graffiti signs are related to gangs. The main technique used in this wedding photo is layering. The position of the groom in the foreground, followed by the bride in the middle ground and that of the wall in the background give this image depth and dimension. The three planes also tell three different stories: a happy groom, a serious bride and an urban graffiti backdrop. Although there is a bit of a distance between the bride and groom in this image, they are visually United by the cement beams on the floor, which create leading lines from the groom to his bride. The viewers eye starts on the left of the frame, hits the groom who is out the focus and immediately travels towards the bride, the main subject of the image. Her white dress contrasts dramatically against the dark graffiti wall making her pop. I photographed this image using an 85 mm 1.2 lens shot that F2.5. That shallow depth of field emphasizes the bride and separates her from the foreground and the background in this photograph. In the post processing phase of creating this beautiful image, I dodged and burnt the wedding picture and increased the vibrancy and the texture of the graffiti brick wall.